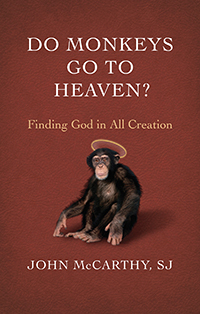 In honour of tonight’s launch of Do Monkeys Go to Heaven? by Fr. John McCarthy, we share this short excerpt from the book for you to enjoy. If you’re in the Toronto area this evening, join us at Regis College. We will be there, with Fr. McCarthy, from 5:30 – 7:00 to celebrate the publication of his newest book. “With the help of the Hubble telescope, a team of astronomers has discovered what they say is the earliest galaxy ever glimpsed in the heavens. A smudge of galactic light on a Hubble image clocks in at a mere 480 million years after the Big Bang – light from a fledgling galaxy 13.3 billion years ago. I admit that anonymous responses to Internet news stories are not the best sources of civil or reasoned discourse. However, they do suggest a certain public mood. I can calmly read the God statement and appreciate its content. The Christian doctrine of creation welcomes this scientific discovery. Creation, as a theological notion, is not fully encompassed by the “how” of the origins of the universe. The person commenting on God as Creator seemed to think the same, given his or her amazement at the discovery of this early galaxy. His or her mind was open and flexible enough to absorb the wonder of science and the mystery of God at the same time. For the respondent, however, such seemed not the case. Missing was an openness to multiple layers of explanation where faith and science could learn from each other. We seem to be slipping into what we could call a “poverty of discourse.” The world is no longer complex and mysterious, a wonder to behold. Rather, lines are being drawn in the sand. We’re on the hunt for who’s in and who’s out. Our world is shrinking to fit our minds – and in the process we truncate the rich variety and stuff of life.